The genus Nidularium was established in 1854 by Leman. The name (Lat. nidulus=little nest) refers to characteristic nestling of the flowers in the center of the rosette. 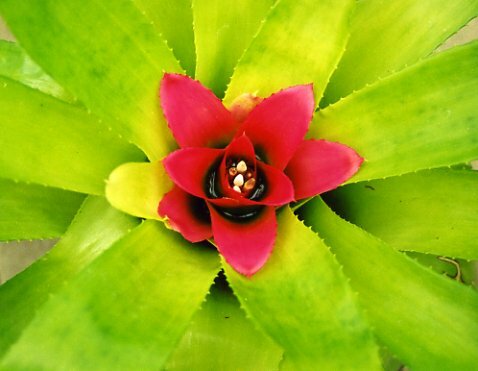 The genus belongs to the subfamily Bromelioideae and comprises some 43 species in two subdivisions, Canistropsis and Nidularium. Nidulariums are available from bromeliad growers but not often seen in garden centers. Nearly all nidulariums grow in the rain forests of eastern Brazil close to or on the ground. Similar to neoregelia, which they closely resemble. Their centers should be kept full of water, even when the plant is blooming. The potting mixture can be watered by letting the centers overflow into it. Fertilizer should be reduced as the plant matures. Too much nitrogen produces oversized leaves. Pups are produced from buds at the leaf axils. The pups are on stolons which may be very short. Pups should be cut away carefully to ensure that their bases are intact. Inflorescence: does not rise above the leaves, inflorescence is nestled in the center of the plant; flower buds emerge in the center and between the bracts of the inflorescence. Bracts are pink, red, orange, maroon, sometimes mixed with green and hold their color up to a year after blooming. In N. billbergioides and N. seidelii (among others) the inflorescence is borne on a long stem.